Josanne Cassar | Let’s get on the bus! You are here: Home » Press Launches » Let’s get on the bus! Let’s get on the bus! 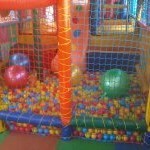 Stuck for an idea for your children’s next birthday party? How about getting on a bus? But don’t worry, this will not involve any long waiting times or wondering whether it will show up. 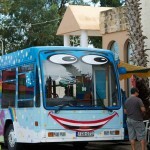 In October 2013, Malta`s first mobile play centre for children was launched by Glyn Turner. As a former truck driver who was looking for work, he set about coming up with an idea which Malta lacked, and hit upon this innovative concept. 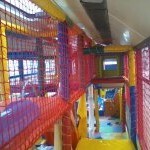 Aptly called ‘The Little Fun Bus’, the brightly coloured bus is fitted with a soft play area, jungle gym, tunnels, slides, a tree house and other fun activities.. 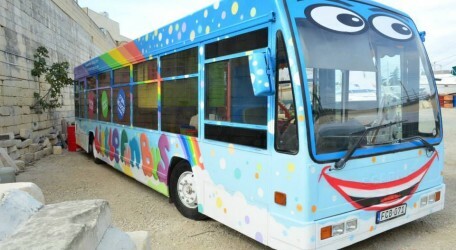 The low floor bus, which Mr Turner expertly converted into a self-contained children’s party, travels around Malta hosting parties for children and delivering a memorable and different experience to all little party goers. 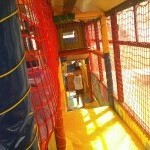 The bus can also be booked for events such as charity fund raisers, galas, corporate events, fun days, festas and any other event where children will be present and need to be entertained. Since the launch of the bus it has received over 3000 likes on its Facebook page receiving likes not only in Malta but from around the world. For more information call 9945 0335 or email [email protected].